On we fluttered, breeze-blown in a torrent of ambition onto the next destination, the stretch of the Rhein River between Mainz and Koblenz. Lonely Planet and my EuroStar book both recommended the region heavily, calling it 'The Romantic Rhein.' Considering my company, this seemed more than appropriate. 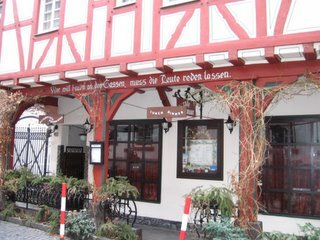 So we took the first train out of Munich, headed toward Frankfurt, where we'd then skip over to Mainz to begin the day. After walking past reserved seat after reserved seat, we reached the final car...where a totally unoccupied private compartment sat, ready for us to fill it. So we threw our bags down and slid into our seats, making sure the door was tightly closed and that our body language spoke with intimidation against joining us in the compartment. 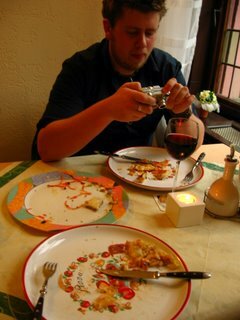 It worked for a while, so did the gastronomic results of having eaten half-chickens and sausages on consecutive days. 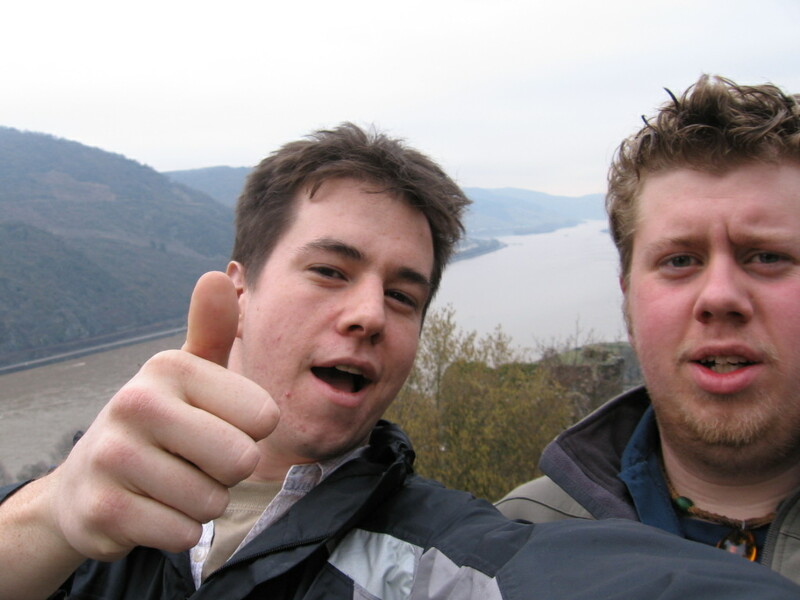 After getting to Mainz, we wasted no time getting on our way. 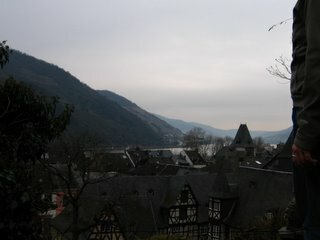 We hit the next train and headed for Bacharach, a town of population 2,400 snug against the West side of the Rhein. 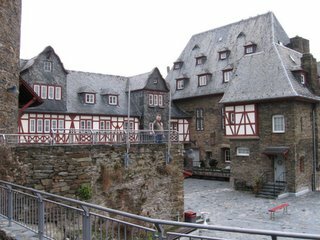 Aside from the Burt Bacharach references, the castle on the hill, inside of which a hostel operates, lured us there for the night. WE WERE GOING TO SLEEP IN A CASTLE BUILT IN THE 1200s! The entire region, Rheinland-Pfalz (der Mittelrhein), tucks into the pocket created by the borders of France and Belgium, making it one of history's most hotly contested areas. Thus, the overall goal of the whole stretch of land was, since occupation, to keep out the Frenchies. This system of castle-building worked for a while, as the fortresses perched on top of the pelt-soft hills made sure the French ate brie on their side. 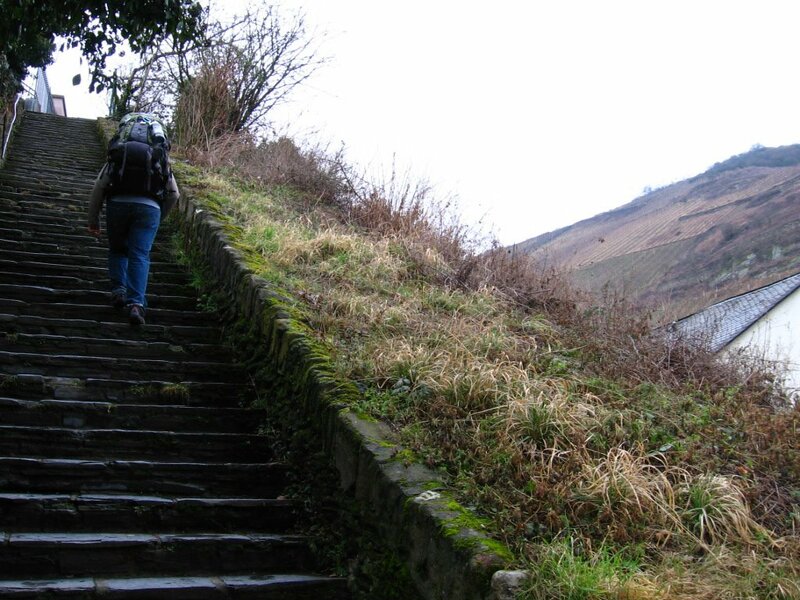 Then Napoleon came and reduced most of the castles to gravel. 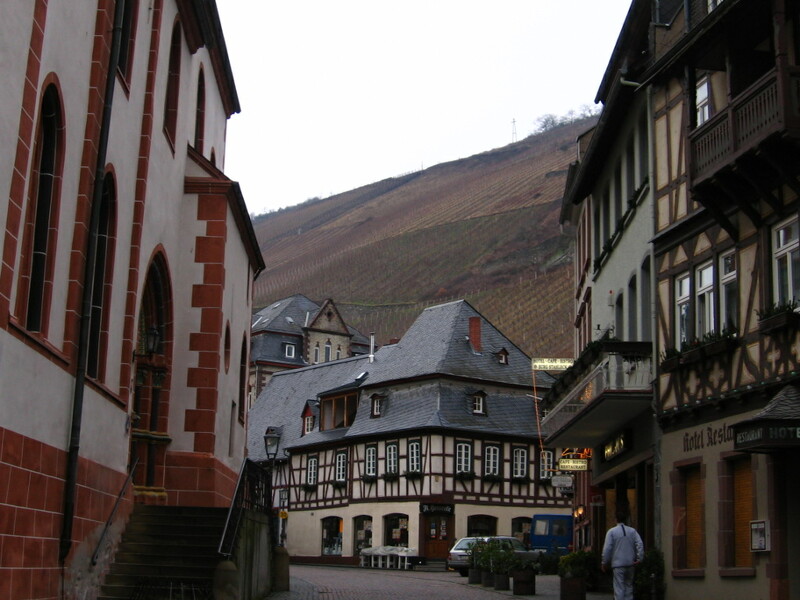 Strangely enough, Rheinland-Pfalz boasts some of the best wine in the world. 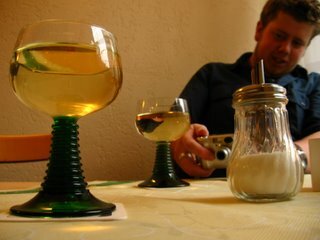 Its Rieslings, the pride of the area, fill the entire sweet to dry gradient. They were delicious. 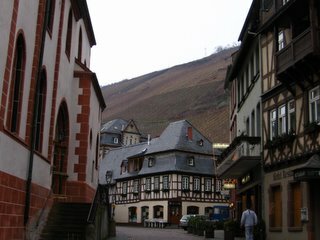 The ride from Mainz to Bacharach first wove through a cluster of tiny, either post- or neo-industrial towns. 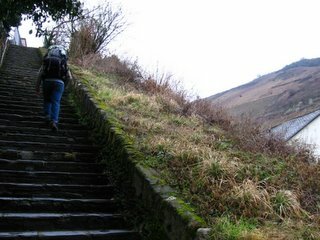 After a number of kilometers, it met the Rhein, sticking to the river through all of its bends until it got to Koblenz. Gorgeous. Even with most of the trees still barren and the temperature dropping like 1950s Americans during air raid drills, the whole scene mothers you, emitting feelings of safety and allowing the soul to breathe. 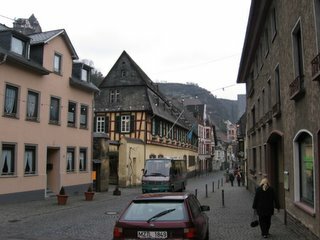 Bacharach, a town that struck immediately as a place that doesn't constrict when it keeps people there for the whole of their lives. Instead of a half-hearted effort to modernize like so many dead towns, it remains, not necessarily stuck in history, but almost exempt from the steamrollers and plastics of modernization. 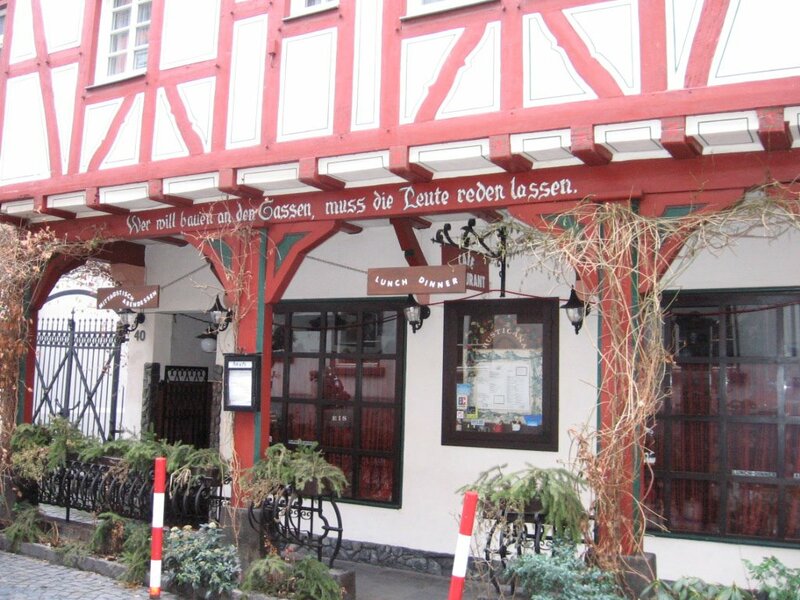 It exists on its wine and its stores and the tourists that string along its cobblestone walks during the summertime. So, pretty cool. 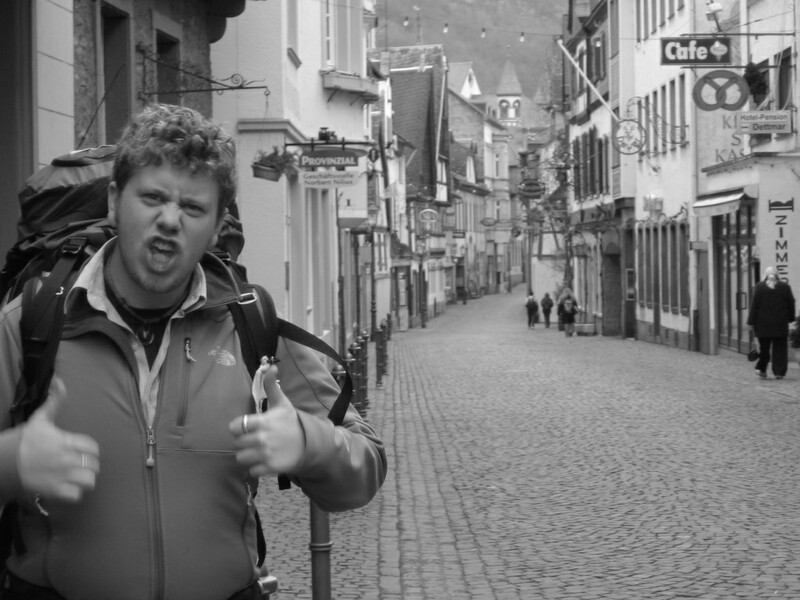 Had to speak in German in the town, which was also real cool. 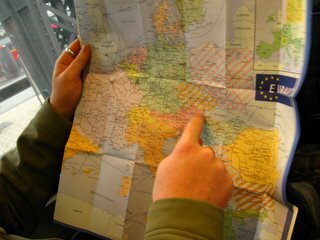 Imagine that his finger were in Germany (the big green one), in between the pink (France) and yellow (Belgium). 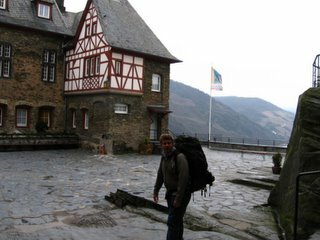 At the train station in Bacharach. We doubled the population when we were there. I forget what this says, but pretty much every storefront in Germany has some saying about how it's important to have (1) good health or (2) a drink. The Castle, Burg Stahleck! We begin our assault on the Mount. 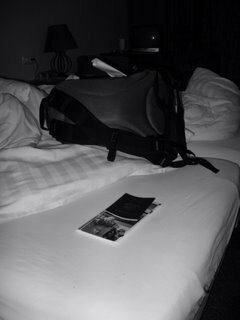 It was harder on Nils because he was carrying a backpack full of three+ months' worth of stuff, like carrying a house. Look to the right of him. The hills are entirely covered in vineyards, grapes in diagonal ascent. We have arrived! Inside the castle courtyard, surveying the land and doing our best to keep out the French. ...and being damn good at it. 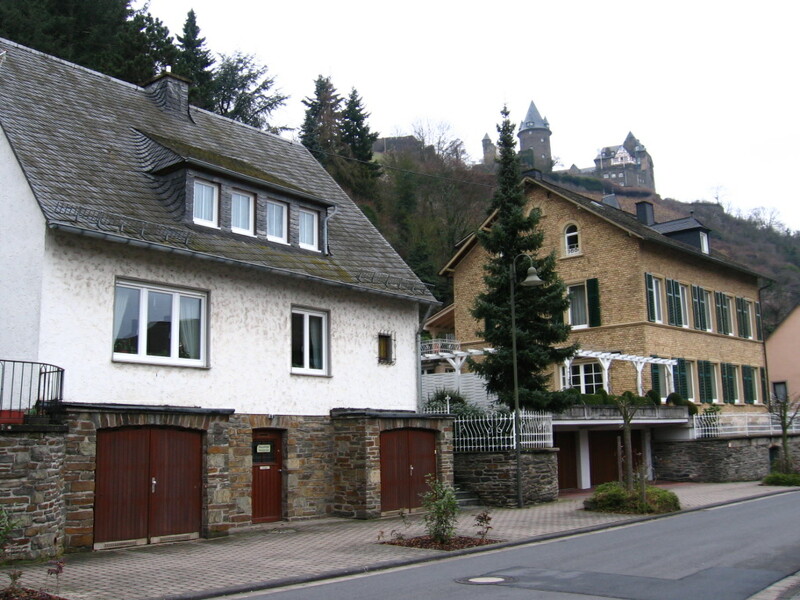 After checking into our hostel (THE ONE IN THE CASTLE), the town awaited. So did pizza. ...and wine. 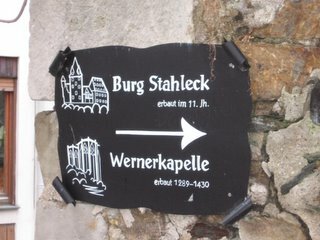 We both got some Trocken (dry) Burg Stahleck wine, made from those grapes on the hills next to the town. One of the best whites I've had. Better than those I-talian ones. And through laughter at limping German on my part and absolutely incapacitated English on the waiter's part, we got ourselves some Kasebrot (cheese bread) and delicious, heavily meated pizzas.